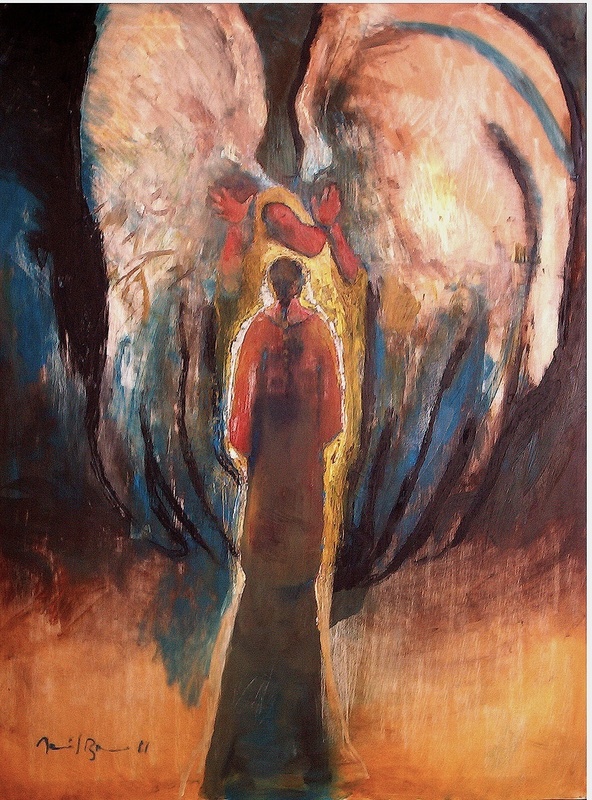 Annunciation: how can this be? In response to this angelic announcement, Mary asks a question reminiscent of Zechariah’s query, “How can this be?” She had not had sexual relations with a man. Ultimately, the purpose of Mary’s question (v.34)—which leads to Gabriel’s answer (v.35) and the giving of a sign (v.36) and word of reassurance (v.37)—is to emphasize that all of this is God’s doing. Gabriel’s response emphasizes that the baby would be born by the power of God. Like the presence of God in the cloud at the transfiguration (9:34), the Holy Spirit would come upon her and overshadow her. The child, therefore, would be God’s child, and he would be called the Son of God. As with all the annunciations in Scripture and in ancient biographical accounts, the purpose of the annunciation is to declare something vital about the identity of the child. The Lukan account repeatedly affirms that Mary’s son would be called “Son of the Most High” (v. 32a), son of David (v. 32b), and finally the title by which he would be most widely recognized, “Son of God” (v. 35). It is not immediately clear how the objections of Zechariah and Mary differ, even if it is certain that the angel can distinguish one from the other. In both cases we subsequently learn what motivated these questions—in Zechariah’s case, unbelief (v.20); in Mary’s case, belief (v.45). One can also distinguish between Zechariah’s request for a sign (“How shall I know this?”) and Mary’s request for an explanation (“How can this be..?”). Zechariah asks for some sign to prove that this will be as announced and will come to pass. Mary simple questions, “How?” Her question simply states she is a virgin, and so “how” is a valid question. But Mary receives a sign The implication of v. 36 is that Mary did not know that Elizabeth was carrying a child also. The earlier reference that Elizabeth remained in seclusion makes this lack of communication plausible. The announcement of Elizabeth’s joy to Mary, therefore, serves as a sign to her. If Elizabeth, who had been called barren, could bear a child, then Mary could be sure that what had been told to her would come to pass also. consequently, the child to be born will be called holy the Son of God. These parallel affirmations do not suggest sexual activity, but do indicate divine agency. The Holy Spirit is identified with God’s power in a way that anticipates Acts 1:8. The verb “to come upon” also anticipates Acts 1:8, and, then, the Pentecost event. The text may call to mind Isa 32:15, which anticipates the Spirit’s being poured out upon God’s people as a mark of the age of peace. The second phrase has connections with the transfiguration scene in 9:34, and more broadly with scriptural accounts of manifestations of the glory of God (e.g., Exod 40:35; Num 9:18, 22). (v.35d): [He] will be called holy, the Son of God. Mission Complete. Gabriel’s parting words ring with reassurance: “Nothing will be impossible with God.” They echo the wonder of Sarah: “Is anything too marvelous for the LORD to do?” (Gen 18:14) and Jesus’ later declaration, “What is impossible for human beings is possible for God” (18:27). A barren woman can bear a child. A virgin can conceive. The Lord can enter into human history as a child. From a tomb can come resurrection, and the Holy Spirit can empower the church for its worldwide mission. It is a promise in the future tense: With God nothing will be impossible. With faith in such power, Mary responds “May it be done to me according to your word,” (v.38) – a response that contrasts sharply with that of Zechariah, with the result that she, surprisingly in scenes of this type, has the last word. She unreservedly embraces the purpose of God, without regard to its cost to her personally. Her response is exemplary, demonstrating how all Israel ought to respond to God’s favor. In describing herself as the Lord’s servant (cf. 1:48), she acknowledges her submission to God’s purpose, but also her role in assisting that purpose. Moreover, she claims a place in God’s household, so to speak; indeed, in this socio-historical context, her words relativize and actually place in jeopardy her status in Joseph’s household. For her, partnership in the purpose of God transcends the claims of family. In antiquity, the status of a slave was determined by the status of the householder. In his characterization of Mary as “slave of the Lord,” Luke has begun to undercut the competitive maneuvering for positions of status prevalent in the first-century Mediterranean world. Mary, who seemed to measure low in any ranking—age, family heritage, gender, and so on—turns out to be the one favored by God, the one who finds her status and identity in her obedience to God and participation in his salvific will. Gabriel has completed his mission successfully. The annunciation would not have been complete without Mary’s trusting, obedient response. Mary had been chosen, “favored,” to have an important part in God’s plan to bring salvation to God’s people, but it is unthinkable that God would have forced Mary to have the child against her will. Mary is an important example, therefore, of one who is obedient to God even at great risk to self. Luke 1:35 Son of God: Previously, “Son of God” was related directly to Jesus’ role as king, a usage well known in the Scriptures (v.32; cf. 2 Sam 7:14; Ps 2:7). In the first century milieu this pointed to a divine sonship, or at a minimum a very significant relationship with God. While much can be said, it should be noted that, for Luke, the relationship is keyed into the work of the Spirit. Jesus is “Son of God” not as a consequence of his assuming the throne of David (as in Ps 2:7), but as a result of his conception, itself the result of the miraculous work of the Spirit. As Jesus prepares for and commences his public ministry, the relation of the work of the Spirit and his identity as God’s Son will be further developed (3:21–22, 38; 4:1, 3, 9, 14, 18). Like John, Jesus is set apart (i.e., “holy”) from birth to special service in God’s redemptive purpose; unlike John—indeed, uniquely in salvation history—Jesus’ sonship extends backward to the prevenient work of God in his creation as a human being. Luke 1:36 your relative: The description of Elizabeth as “your relative” serves three functions. Most obviously, it is one more way in which the stories of John and Jesus are interwoven. Second, it serves as a bridge back to the story of Elizabeth, preparing for the encounter between Elizabeth and Mary (vv.39–56) and John’s birth (v.57). Finally, it is a further indication of how carefully Luke has staged his characterization of Mary. Only at the end of this scene do we learn that she belongs to the family of Elizabeth and may thus share her ancestral heritage; the timing of this disclosure is significant, for the most memorable quality of Mary for Luke is her relation to God, a relationship God initiated. Luke 1:38 handmaid of the Lord: In describing herself as the Lord’s servant, she acknowledges her submission to God’s purpose, but also her role in assisting that purpose. Moreover, she claims a place in God’s household, so to speak; indeed, in this socio-historical context, her words relativize and actually place in jeopardy her status in Joseph’s household. For her, partnership in the purpose of God transcends the claims of family. In antiquity, the status of a slave was determined by the status of the householder. In his characterization of Mary as “slave of the Lord,” Luke has begun to undercut the competitive maneuvering for positions of status prevalent in the first-century Mediterranean world. Mary, who seemed to measure low in any ranking—age, family heritage, gender, and so on—turns out to be the one favored by God, the one who finds her status and identity in her obedience to God and participation in his salvific will. This entry was posted in Scripture and tagged 4th Advent, Annunication, how can this be by Friar Musings. Bookmark the permalink.